IRRI Education, in collaboration with the Rural Development Administration (RDA) of the Republic of Korea, trained a new batch of agricultural technicians and extension agents, at the International Technology Cooperation Center (ITCC) in Jeonju, South Korea, May 16-25, 2018. The group, which consisted of 17 participants from nine Asian countries: Cambodia, Indonesia, Lao PDR, Mongolia, Myanmar, Philippines, Thailand, Sri Lanka, and Vietnam, included a strong representation of women (15 females out of 17 participants). 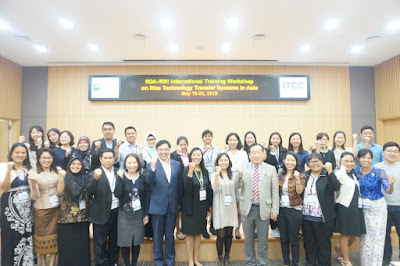 The participants learned novel and key technologies in rice cultivation, including topics on rice breeding, disease and pest control in rice, and the agricultural extension system of South Korea. They were also exposed to the Korean culture by visiting cultural heritage sites. They also experienced an overnight stay in a farm that gave them exposure to traditional farmers’ practices in crop cultivation. The visits to technology center and research facilities also provided new insights to the participants on modern trends and development in rice research. Moreover, resource persons from IRRI reinforced the discussions during the seminar with inputs from Maria Socorro Arboleda, who conducted a talk on Presentation and Facilitation Skills; Carlito Balingbing, who conducted lectures and hands-on exercises on rice postharvest management; Carolyn Florey, who presented a range of digital tools that IRRI is implementing, such as Rice Crop Manager, Rice Knowledge Bank, and Rice Doctor through hands-on learning and demonstration; and Mary Ann Batas, who taught participants how to make effective work plans. This resulted to participants drafting their own work plans on their own projects. Participants were required to present their own work plans making use of the knowledge they gained from the lectures and applying the skills they learned on presentation and facilitation. A delegate from the Philippines, Melanie Aileen De Peralta, was very impressed by the farmer-entrepreneurs in Korea which she also dreamed for fellow Filipino farmers. “My mind is full of ideas and new information because of this training,” she added. Ms. Jang Jung Hee, Deputy Director of ITCC, in her email of appreciation to Dr. Matthew Morell, DG of IRRI, said that she is very thankful to IRRI for all the preparations and facilitation in making the event possible and successful. She was very glad to hear from participants about their appreciation of the learning on rice technology transfer systems through series of lectures and exercises from the resource persons both from IRRI and RDA. She looks forward to the continuation of support and cooperation between IRRI and RDA.